Let the mystery of this boy-meets-girl story unfold. There is a piece of popular culture of the last 20 years which would make an ideal point of comparison for Jeff Talbott’s i, now receiving its world-premiere production at Pioneer Theatre Company. But naming that particular point of comparison would be saying too much—and that’s just one of the things that makes it hard to talk about i. On the simplest level of synopsis, it’s a boy-meets-girl tale. Jake (Todd Gearhart) is waiting at a pharmacy when Sarah (Kathleen McElfresh) comes in to pick up a prescription. They start up a conversation, in a “meet-cute” scene that’s funny and charming. A tentative relationship blooms. What could be a more universal story? Except, of course, it’s more complicated than that, starting with the reason each one of them is in that pharmacy to begin with. Elements of science fiction weave their way through the story, but like the best science fiction, the high-concept premise really becomes a way to explore something about humanity in an allegorical way. What Gearhart and McElfresh bring to this relationship, in two beautifully pitched performances, is an exploration of what experiences in our lives define who we are, and what we become when some of those things are removed from our lives. Director Karen Azenberg oversees a remarkable physical production—notably Paul Tate Depoo III’s scenic design and Jax Messenger’s lighting—that balances the intentionally chilly remoteness of the setting with something as simple as a single tree providing a reminder of untamed life. This is in some ways a variation on that other narrative to which I referred, and perhaps the comparison doesn’t do i any favors. 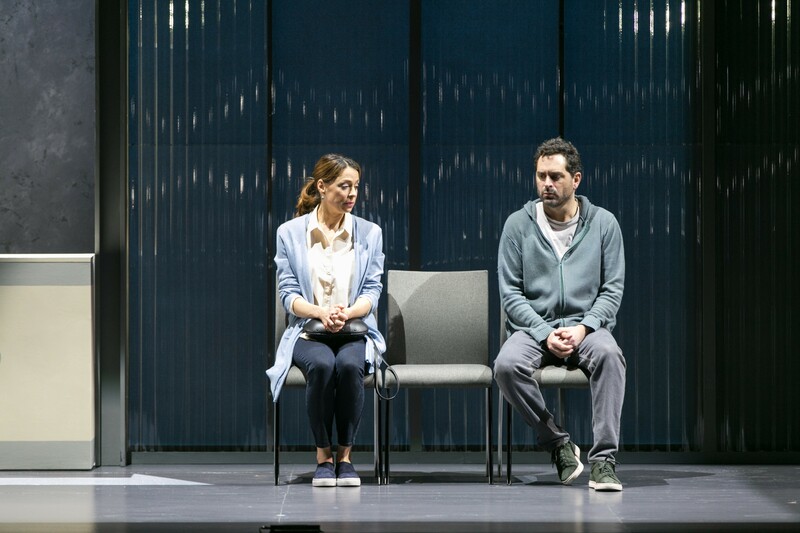 Talbott’s script is sharp and perceptive, savvy about the ways that technological advances inevitably come with consequences, though he perhaps strains too hard to give the play’s oblique title multiple layers of significance. While it might be unfair to say too much to a potential viewer about what i is about, it’s the kind of thought-provoking theater that’s exactly right for the kind of person who’s willing to turn themselves over to the artists. Maybe that’s a perfect summary for a play that wrestles with taking a risk on what you know, and what you don’t know.